Ever since playing Roman Seas a few years ago, I've had a bug for Ancient naval warfare - at least the gaming side of it. I once had a decent sized fleet of paper ships in 1/300th scale, but sold it off after I decided to use 1/1200th scale ships. I somewhat regret doing this for a couple of reasons, one I sold it to someone outside of the local gaming group, and for another I've yet to replace it. Anyway, I've acquired a few 1/1200th & 1/900th models; still to be painted. The 1/1200th are Langton that Kevin Smyth was kind enough to sell for a bargain price. The 1/900th are Valiant models that were also bought for a good price at the last Enfilade! convention. The two scales seem to be compatible with each other. This especially so as the basic construction of the ships are similar and the main difference is the size. My gaming buddy Adrian and I are seriously contemplating fleshing out our respective fleets with some Navwar models. BTW, I spent a relaxing evening sipping Bloody Marys and cleaning my Walther P38/P1. I spent the day at work daydreaming about it; plan to hit the firing range on Sunday with another gaming buddy, Scott A. with his Colt .45. Should be interesting - two of the mainstay sidearms of WW2. EDIT: I found this great site on painted Langton models by one Mr. Watkins. I will definitely be referring to this site. EDIT+1: Another great site; this time with an awe-inspiring amount of ships. Got a call this afternoon that the Walther P38/P1 was ready for pick up; that is, my background check was completed and the real me must not be on file. Anyway, it's even nicer than I remembered from quickly looking it over on Saturday. I thought there was more wear, but it looks fine. I'll try and figure out what year it was made using the serial number. Disassembled - as far as I want to for now anyway - along with the two magazines, and cleaning kit that came with it. I'm not sure what that chain thingee is; it has a bore brush clipped to it. Yes, I will definitely spend some time cleaning it this weekend - or maybe tomorrow night. Hope to test fire it at the range this weekend. BTW, I'm not a gun collector, but this is a nice historic piece. This is actually only the second gun I've ever owned. I once had a .380 over 20 years ago; it was for personal protection, but I got rid of it after a year or so. This pistol was acquired as sort of a fluke. My wife mentioned we should get something for home protection - so I was initially looking at shotguns (Mossberg 500 or 88), but just last week the local Cabela's said they had a "very limited stock" of P38/P1's going on sale this past Saturday - first come first served. I lucked out and got the very last one - missing a holster, but who cares. I have a Bianchi holster (the US military issue for Berettas) - fits good. Just a quick update before taking a break. Actually not so much a break, but will go in my backyard to cut out some bamboo to transplant in another area of the yard. Anyway, painted the crests and metal ornaments for the swords, as well as cloth ties for the arm and shin armor. Some of the figures also had thigh armor (haidate); these were painted too. Kept the painting to basic colors; the sword scabbards are either black, for the guys in russet or red armor; and russet color for the ones in black armor. For the sword grips, red, blue or green was dabbed along the grip to make it appear as lacing. I think all that's left to paint is the clothing - which only show up in small areas from the armor. That and their sashimo - which I'll take a little time researching for nice ones. Oh and their spears still need to be made out of brass rod. I'll try to make these a little nicer than the ones the Ashigaru have. Finally managed to get some colors onto these figures. These are three packs of foot Samurai wielding spears. Started on the armor first (besides their faces) as I wanted to get all the troublesome lacing out of the way. The sculpting is very nice, but I wish they'd exaggerated the lacing to ease painting. This morning I lucked out and was able to buy the last Walther P38 the local Cabela's outdoor store was selling as limited stock. In fact, they had just put up a sign that the P38's were sold out before my number was called. I stuck around to check out a Mossberg 88 shotgun. When I mentioned I had really came for a P38, the salesman said there was one left. Apparently the guy before me changed his mind because it was the display model and didn't have a holster. They knocked off the price and I was able to get it for about $330.00. Of course, these are pre-owned guns that were purchased from Germany. I think Cabela's unloads these every so often in "very limited" quantities (their terminology). Anyway, I have to wait about 5 days for the background check. I'll post pics of it after I pick it up. Hosted a Sharp Practice game today at the Game Matrix. This was the final Truants game for the season. Several of the Truants managed to make it in for the game today. Bruce and Al ran the French, and Adrian and Scott the British. The scenario was a French plan to ambush and destroy British and allied forces. The French commander, Colonel Steve Zissou "the Mad" had devised a scheme to trick the British into thinking an artillery train was carrying gold to their garrison. 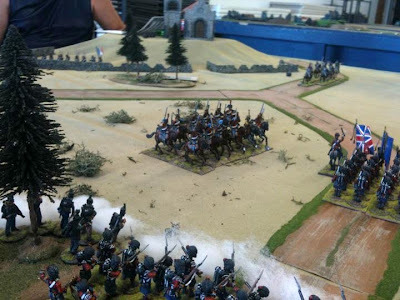 Unfortunately, the plan sort of back fired as the British, with units of 42nd Highlanders as well as two units of British Rifles used superior fire power to send the French scurrying back to their garrison. As I was GMing, I only managed to take a few photos - not one of the artillery train, unfortunately. In spite of most of the players being new to the rules, as well as me being a bit rusty with them, we all had a good time. We even discussed adding some house rules to make them flow better. One was changing Formations. We think a Big Man with appropriate Initiative should be able to change his Formations without having to roll for movement to succeed. Just the cost of the Initiative should allow this. EDIT Here are a few more photos taken by Adrian (lifted off of his Facebook): Guerrillas on a hill spying the French. Hussars taking fire from their right flank - prior to charging into the Highlanders in column to their front. Also, I had recently posted a "Want Ad" on TMP for Old Glory French Middle Guard and/or British Fusiliers. TMPer VirtualScratchBuilder quickly responded that he had a few spares and sent them to me free of charge. They look great and size up well with Perry and Victrix. Here they are with the previously completed bow unit. Just need to get some command figures. I heard some plastic Ashigaru were supposed to appear soon, but it's just as well I already have these. They're nice enough and I'll likely buy other stuff instead. BTW, the Perry Samurai will add some pizaz to the the army as they'll have sashimono. I'm not entirely convinced all Ashigaru wore sashimono anyway. Now I can get started on the Perry foot Samurai; or maybe the Crusader Spanish Scutarii. Well, finished painted & dipping these guys today. Nothing fancy, but still pretty good for me considering I didn't work on them until after a day trip to Bremerton Naval Base. Actually just spent some time driving around Bremerton and stopping in the BX. Pretty sparse compared to Fort Lewis or McChord Air Force Base - or as they are now called Joint Base Lewis-McChord. Anyway, here are the Ashigaru still wet from their dip. I'll spray them with Dullcote tomorrow after they're dried completely. How they looked prior to the dip with just basic block painting and a little bit of highlighting on the black portions. I'll post better pics after they're based. Then I'll have to get started on those marvelous Perry Samurai. These figures are not bad at all - IMO. Some of the individual poses are quite nice, actually. Funny how some OG sculpts, even within the same pack vary in quality. One would think this is would be common, but taking the Perrys as an example and all of theirs are uniformly excellent. Overall though, I'm quite happy with these guys, especially since I got them a discounted price from Warweb.com. These will be painted in a production line system, like the earlier archers were. Basic block painting of flesh, the minimal areas of exposed clothing, and the little bit of lacing on the armor. Once the paint is blocked painted, they'll get a dip in Miniwax Tudor Stain. They will also be based the same as the archers were - mostly on four to a 40X40mm bases, with a few singles. This is our second to last Truants game day this year; Mark and Kevin need to get back to schooling another generation of young Americans soon. Today's game was hosted by Dave S., a US Navy veteran with a love of it's history. Here you can see one of his many fine handmade ships for today's game. EDIT: The ships were actually scratch-built by Mark W. - my apologies. The scenario was based on the Battle of Lake Ontario (another oops, I initially thought it was Lake Erie - oh, well, they're both Great! ), and we used rules Dave designed himself. The turns are based on activating ships in order of highest cards assigned to individual ships. All ships get two cards, and the player can select which one to use - consulting with fellow players on the same side is allowed. I liked this sequence, although I felt placing the cards next to the models at the start of each turn distracts from the otherwise nice setup. Here are the US ships, whose guns far outclassed and outnumbered the British ships' guns. Even the small schooners initially being towed had some heavy firepower. Along with Bruce M. and Adrian, I ran some British ships. The two I had were small and had only guns on the port and starboard side. In fact, none of the British ships had guns on the bow or stern. Most of the US ships had these. Here is the ending stages of the battle - clearly an American victory. All the players agreed the firing mechanism was fine; just enough detail, but not super chart heavy. There was some recommendations for tweaking little things - like speed and turning, but nothing big. I think keeping the cards with the players and not next to the ships would make the game look nicer while being played. I'm hosting next week's final Truants game for the season. It'll be a Peninsular War skirmish game using Sharp Practice. Haven't played the rules for sometime, so should be refreshing. 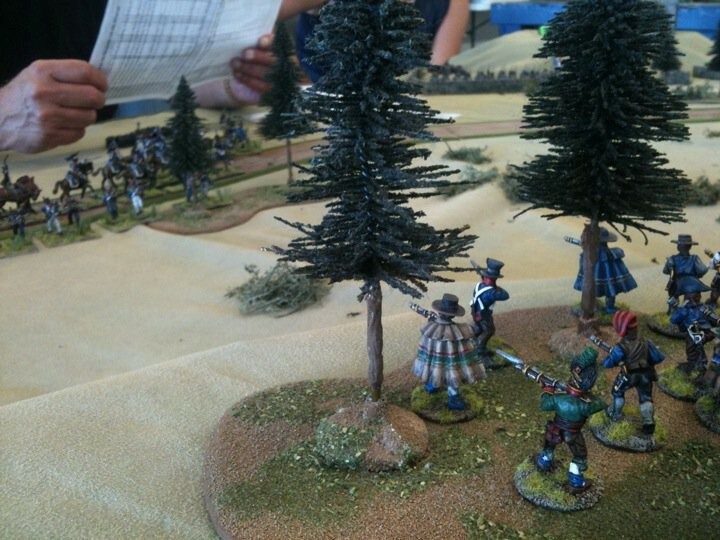 I really like these Sharp Practice for "black powder" era skirmish. However, for larger games, I'm going to try using Warlord's Black Powder. Finally, when I got home today - the long-awaited (about a month) order from Warweb.com arrived. Well-worth the wait. It contains the Old Glory Ashigaru spearmen and teppo to fill the rank and file of a Sengoku army; and also several packs of Crusader Spanish Scutarii to add to a planned Carthaginian army. Here's a simple layout with easily transportable terrain that will be used for an upcoming Sharp Practice game. Since the game will be held at our FLGS, The Game Matrix, I wanted stuff that was not only easy to set up, but also easy to store and transport. The ground cover is a cloth which has been given some variation of color - mainly light green & tan. Two low hills were created using some packing material that was cut into irregular shapes, and stuffed under the cloth. One hilltop is forested, and the other has a church which will be a garrison for the French. Looking at the set up now, I think I'll either pull the walls back or remove them altogether - to allow more space for cavalry to maneuver. ADDENDUM: I rearranged some things to allow a larger area to maneuver forces - the two hills were moved back towards their edges; and the walls were moved away from the roadside and more or less enclose the church/garrison. A copy of Warlord's Black Powder arrived yesterday in the mail. Skimmed through much of it last night until being overwhelmed by cheap wine. At the same time, I'm getting ready to host a Sharp Practice game in a couple of weeks. Haven't played it in over a year, but it's all coming back pretty well. The two figures are Victrix models that I just painted as they were "needed" for the Sharp Practice game. One a Big Man, the Pioneer to fill the ranks. It's nice to know the current basing of my Napoleonics will work with Black Powder. The individual figures are on 20mm washers - which are then mounted four to a stand for line units. Rifles and other skirmish type troops are mounted either as singles or two to a stand. As far as the basic rules go, I'm glad I slept on the movement portion. Last night I initially had trouble reconciling the commands for movement - specifically when does the movement end and a new one begin. I think I have it now - but, a playtest will tell for sure. Another recent project was trying to get my pale green gaming table cloth a little more varied in coloring. Using a discount coupon for Jo-Ann's, I picked up a set of "camo" fabric paint. At first it looked promising, but after the colors dried, they seemed to have faded back to the original pale green. The cans don't cover that much area too; and not really worth the price (before the discount, for sure). Not wanting to spend another dime on this project (at least for now), I delved into my left-over spray paints and thought the "Sweet Cream" that was used as base flesh coat for some Gauls awhile back would work. I ended up emptying the can and it looks okay. Could use some highlights of other colors here and there. Good enough for now, though. These were also given a quick basic paint job, and then a Miniwax Tudor Stain "dip." I don't think there's a faster way to get models ready for the table (painted ;) ). Here's a comparison photo of sorts; beside the two OG models are Victrix and Perry models. I think they fit together very well. I was lucky enough to have scored the OG model for $10 dollars at the Bring & Buy table at our local convention, Enfilade! Doug Hamm brought it all the way down from British Columbia - what a great deal. Thanks, Doug. These models will be used in a Sharp Practice game in a couple of weeks. Well, here they are; nothing fancy, but solid and useful figures for a range of Ancient armies. Not bad for about .60 cents a figure. They are pretty durable too; I dropped some of them onto a concrete floor while spraying them with Dullcote. They sort of bounced off the floor undamaged. I will likely build 10 slingers as well. I do need to get bucklers for all of these guys too. This is right after I gave them all a very basic block paint job. In fact, a pretty big brush was used for most of it; only used a smaller brush for some areas of the French Artillery Train guys. After they're completely dried - at least 24 hours; I'll hit them with a dull coat spray and finish basing/flocking them. Only 12 for now - these were part of the packs that came from an ebay win. I mainly wanted the Hypaspists in the bid, but these are nice and have several possible uses. In addition to Imitation Legionaries, they could be used as Carthaginian Veterans (w/captured Roman gear); or maybe even Thorokites. Of course, I'd have let my opponent know that their weapon not really pila - they just appear to be. I used Veni Vidi Vici decals for the shields. They are sold as 15mm, but they fit well enough. Somewhat slower than we were last year, we faithful Truants showed up today at The Game Matrix for another great game. This one was an ACW naval game GM'd by Kevin Smyth. I think the rules are called "Ironclads." Most of the other players were familiar with these rules, but as I'd only played these rules once before (last year, at that), it was bit intimidating at first. Of course, the other Truants are always helpful trying to bring me up to speed. After about 8 turns, I think I actually understand the basics now. Anyway, it was a really fun game, and pretty fast considering it does require a lot of chart referencing. For more about the rules and models, please visit Kevin's blog. Along with Mark and Chris, I ran some of the Union vessels. The one on fire is the Rhode Island, run by yours truly. The fire was initially started by hits from the Confederate fort, but I helped increase the level by consistently bad die rolls - trying to put it out. Here's the other ship I ran, the Kearsarge; which I managed to keep afloat even after an attempted ramming by a Confederate ironclad. This is one of our, Union, ironclads run by Mark. He did really well bombarding the fort and keeping his distance from Confederate ships. The game was called a Confederate victory by a narrow margin. Their fort was likely to fall to offshore bombardment, but the wooden ships that Chris and I ran were taking a beating from the Confederate ironclads. We were at a disadvantage as the scenario had us towing (and greatly slowing our movement) boats with mine clearing personnel from an earlier mission. We eventually ended up cutting their lines to fend for themselves, but by then it was too late. We should've cut them free early on and headed full-speed towards the fort and assist in reducing it with gunfire. That's what I think anyway. Not sure what next week's game will be, but I will likely host a Sharp Practice or Great War game the week after. ADDENDUM: For more detailed report of this game, please see Kevin's blog. Also put together some test/sample figures for a bowman, couple of slingers, musician and standard bearer. There is another simpler standard that appears to be horsehair topped. The bows and quivers with arrows are particularly nicely sculpted. The sword and scabbard are a bit oversized, but still nice. This set is great for a parts bin as it has a lot of standards and horns for musicians. The javelinmen will be painted block-style in basic colors and then given a dip in Miniwax Tudor Stain. Plan to add bucklers so they don't get auto-killed on hits. Since I have enough Cretan archers already, I'll probably finish the rest up as slingers. I already have a lot of Redoubt slingers from their Trojan War range, but as they are stark naked, I think these tunic wearing guys will look better for later periods. Now I'm off to my FLGS to check in on a Truants game.